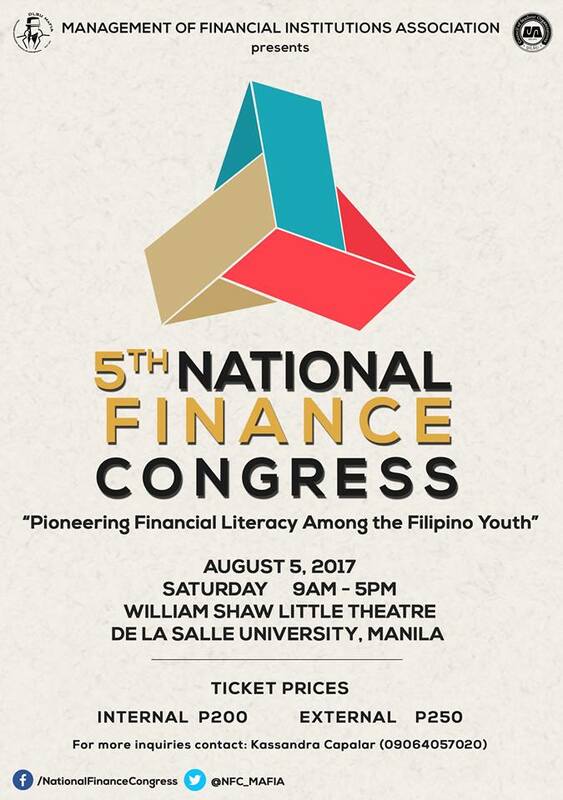 With the theme, “Pioneering Financial Literacy Among Filipino Youth”, the De La Salle University – Management of Financial Institutions Association (DLSU-MaFIA) will be hosting the 5th installment of National Finance Congress on August 5, 2017 (Saturday) at William Shaw Theater, De La Salle University. The event aims to promote financial literacy by equipping its participants especially students with essential finance skills and knowledge that are necessary on withstanding the competitive working sphere. It also intends to establish and strengthen the financial foundation of the youth today in contemplation of prospective challenges posed by globalization and shifting marketplace. Lastly, it aims to provide future leaders the necessary knowledge and skills in making logical and strategic decisions to optimize their investments and portfolios. The topics for the event include Philippine’s Economic Outlook on Investments, EconomicsFinance, Digital Innovations in Banking & Finance, and Financial Literacy for Millennials. As for the speakers, we’ve invited Mr. Edmund Lee to discuss about Investments, Mr. Alvin Ang to discuss how the Philippine economy affects Financial Markets, Mr. Lito Villanueva to discuss Digital Innovations, and Mr. Jayson Lo to discuss Financial Literacy. Plus, there will be additional workshop sessions about Personal Development brought by our sponsor, John Robert Powers, which the participants may opt to attend. The event will be divided into two sessions: 9AM-12PM for the morning session, and 2PM-6PM for the afternoon session. The morning segment caters to starters which will focus on establishing financial foundations and introducing different investment options. Meanwhile, the latter segment is dedicated to those with advanced knowledge and will focus on deepening their understanding on the latest financial trends and the markets. 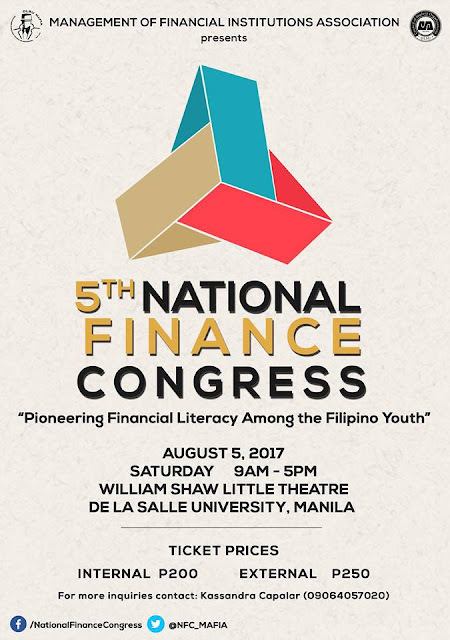 To know more about this event, please visit and like the official Facebook page at https://www.facebook.com/NationalFinanceCongress/ and follow our official Twitter account at https://twitter.com/nfc_mafia . You may also contact one of the project heads, Kassandra Capalar at 09064057020/09478586025 for any inquiries.